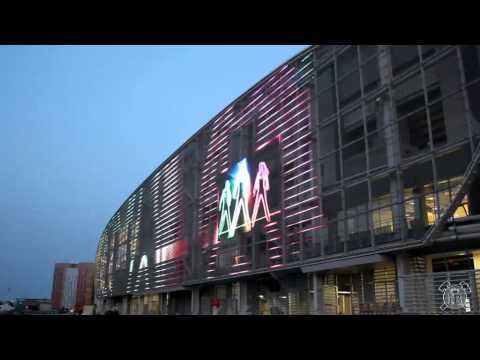 IMAGIC WEAVE® masters the balance of aesthetic structures and illumination art. 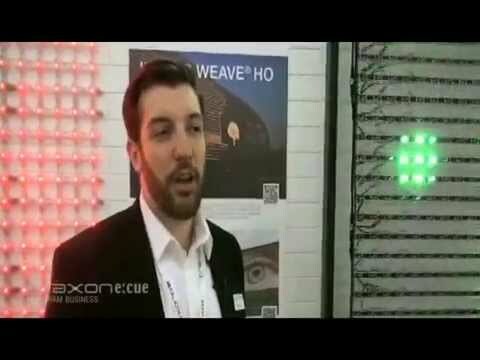 The creative and sustainable possibilities of Traxon LED tubes integrated into the rugged structural durability of Haver & Boecker’s stainless steel mesh, meld together to become a woven grid equipped with individuallyaddressable LEDs, which converts building façades into unique, transparent canvases for vivid, large-scale media. IMAGIC WEAVE® steel composition act as a flat, unobtrusive second skin, protecting the building from harsh elements and harmful UV rays while serving as a thermal layer. Its linear LED configurations are easily attached to the mesh structure with a patented clip system, which enables uncomplicated maintenance and addition of LED configurations. Various pixel pitches render them capable of medium resolution graphics, text, and video animations in full color. The IMAGIC WEAVE® range is IP67-rated for indoor and outdoor environments, with an available optimal viewing distance of 40 meters to 400 meters. IMAGIC WEAVE units are custom built for each individual project, and are controllable by DMX512 and e:pix/DVI input signals, Smart Chip technology, and intelligent software for maximum control of even the most intricate media scenarios. Rugged structure Built on the durable structure of Haver & Boecker’s stainless steel wire mesh, IMAGIC WEAVE® HO (High Output) and IMAGIC WEAVE® HE (High Efficiency) communicate strong industrial design influences and contribute to the character of any façade with its clean, non-obstructive surface. Many customization options LED profile length; number of pixels (from 8 to 72 LED pixels per profile piece); and the configuration and location of each LED profile, can be custom selected. Simple assembly Linear LED configurations are easily attached to the steel mesh with a patented clip system, allowing easy installation and maintenance of the LED tubes. Medium-resolution With typical pixel pitches of 40mm, 50mm, and 62.5mm for IMAGIC WEAVE® HO, and IMAGIC WEAVE® HE, the product line is capable of a wide range of resolutions in full color at various brightness levels up to 8400 nits, visible in daylight. Outdoor-rated IMAGIC WEAVE® range is IP67-rated, UV-resistant, and designed to withstand outdoor elements. Additionally, it serves as a second skin, shielding building façades from sunlight while acting as a thermal layer. Smart Chip technology Each pixel is auto-addressable and easily configured, controlled via DMX512 and e:pix (DVI-capable) protocols.